Go anywhere in the world, and you will find variations of two universal behaviors &#x2014; actions inspired by love, and an extreme dichotomy of hatred. When we are intentional about love, we prepare ourselves to rise to be the very best that God created us to be. Actions of love will drive out darkness. These intentional behaviors of love have the potential to change relationships, home environments, hearts children, corporate culture, church, and our community. To know love in its purest form, we must go to the origin. We must learn from our Heavenly Father, who is Love. &#x201c;Whoever does not love does not know God, because God is love&#x201d; (1 John 4:8). 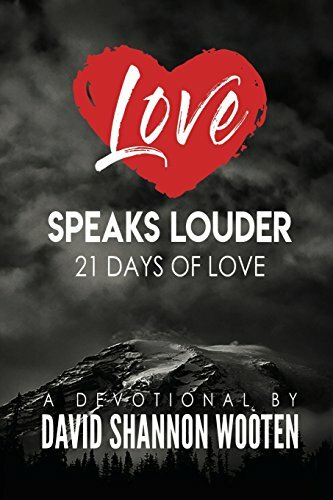 Love Speaks Louder, 21 days of love that will prompt your thoughts and heart toward God&#x2019;s love and the Scriptures that define love. This book is a devotional that places the Scriptures into context and applicable to your everyday life. The reflection questions at the end of each chapter will prompt the Holy Spirit to speak where you are in life directly. My hope is this devotional book will ignite and spark a revival of God&#x2019;s love in your life. The people you come in contact with will experience Christ&#x2019;s love through you. David Shannon Wooten is the lead pastor at Newspring Church in Springboro, Ohio. Shannon&#x2019;s passion is to encourage people in their journey of faith in Christ. He has dedicated over 25 years teaching Biblical principles that inspire and equip people with practical application. Shannon has mentored individuals and has coached church leaders to help reach their full potential. He has helped revitalized churches and has successfully led the merger of two churches. Shannon, his wife Bonnie and their children Shantelle, Shalene, and Ross reside in the Cincinnati/Dayton Ohio area. You can connect with Shannon by following his blog at davidshannonwooten.com and on social media. You can also listen to messages or join a live service online at newspringlive.com.